SANTA CRUZ, Calif.— Southern sea otter numbers have declined off the coast of California since peaking in 2016, but the average population count remains above 3,090 for the third consecutive year. According to the U.S. Fish and Wildlife Service’s Southern Sea Otter Recovery Plan, the population average count would have to exceed 3,090 for three consecutive years for southern sea otters to be considered for delisting under the Endangered Species Act. Despite the recent dip in numbers, the population average count this year has reached this three-year threshold. According to data just released by the California Department of Fish and Wildlife (CDFW) and U.S. Geological Survey (USGS), this year’s average count of 3,128 was 58 sea otters lower than the 2017 survey. Southern sea otters, Enhydra lutris nereis, are designated as threatened under the Endangered Species Act of 1973. In part, this year’s dip reflects a 2.2 percent decrease in the three-year average count of the sea otter’s mainland population, which stretches from about Point Año Nuevo in San Mateo County to a few kilometers west of Gaviota State Beach in Santa Barbara County. In contrast, the small sea otter population at San Nicolas Island continues to increase. Scientists from the CDFW, USGS, and the Monterey Bay Aquarium have conducted this range-wide census of southern sea otter populations every year since the 1980s, except for 2011, when poor weather conditions prevented completion of the field research. Researchers compute the annual population index and evaluate population trends, providing the USFWS and other resource agencies with insight into southern sea otter abundance and distribution. 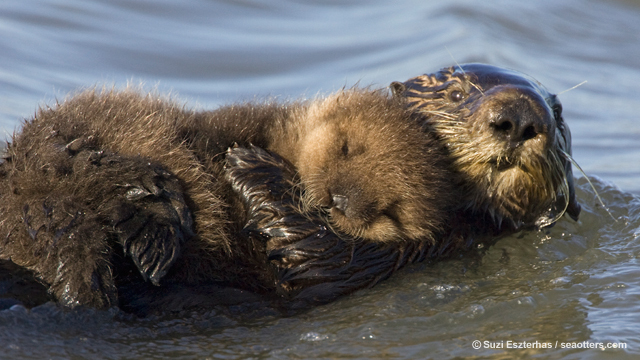 The mainland population of sea otters was largest in the central part of the species’ range, which is between Seaside and Cayucos; it increased slightly in the southern part of the range. North of the central region, however, the five-year trend in sea otter populations continued to drop. Changes at the range ends have implications for the long-term outlook for sea otter recovery. “We continue to recover high numbers of shark-bitten sea otters along the northern and southern ends of the range. These are the same areas we’ve documented a decrease in abundance. This trend is concerning and is likely impacting population expansion and recovery,” says Mike Harris, senior environmental scientist with the CDFW. In addition to the sea otter population along the mainland California coast, USGS and partners also survey the sea otters at San Nicolas Island in the Southern California Bight. This population, established by introducing sea otters back into the area in the late 1980s, struggled at low numbers through the 1990s. However, over the last decade, the population has grown rapidly at an average rate of about 10 percent per year. The sea otter survey and stranding programs are just one part of a larger research program investigating sea otters and their role as predators in coastal ecosystems. As a “keystone” species, sea otters can give scientists clues on the health of Pacific nearshore ecosystems, which support diverse wildlife species and provide economic support for coastal communities. To keep a finger on the pulse of sea otter populations, USGS researchers monitor changes in the kelp forest ecosystems that provide sea otters with suitable resting and feeding habitat. USGS also collaborates with CDFW and the Monterey Bay Aquarium in running a sea otter stranding network. The findings from these coordinated efforts inform and support effective management of sea otter populations to guide them toward recovery. The annual population index is calculated from visual surveys conducted via telescope observations from shore and via low-flying aircraft along the California coastline by researchers, students and volunteers from CDFW’s Office of Spill Prevention and Response, Monterey Bay Aquarium, USGS, UCSC, USFWS and the U.S. Bureau of Ocean Energy Management. This year, the surveyed coastline spanned from Pillar Point in San Mateo County, south to Rincon Point near the Santa Barbara/Ventura County line, and included San Nicolas Island. Sea otters were presumed extinct in California after the fur trade years, but they were rediscovered in the 1930s, when about 50 animals were documented near Bixby Creek north of Big Sur. Sea otters are considered a keystone species of rocky sub-tidal ecosystems because they prey on sea urchins that, if left unchecked, can decimate kelp beds. Scientists also study sea otters as an indicator of nearshore ecosystem health, since sea otters feed and live near the coast and often are the first predators exposed to pollutants and pathogens washed down from coastlands, such as the microbial toxin microcystin. The public can report sightings of stranded sea otters to institutions listed on this webpage. More detailed survey results and maps are available in the full report “Spring 2018 California Sea Otter Census Results,” which is available online. The California Department of Fish and Wildlife manages California’s diverse fish, wildlife, and plant resources, and the habitats they need, for their ecological values and for their use and enjoyment by the public. Visit Wildlife.ca.gov and follow us on Twitter @CaliforniaDFW and Facebook. The mission of the U.S. Fish and Wildlife Service is to work with others to conserve, protect, and enhance fish, wildlife, plants, and their habitats for the continuing benefit of the American people. We are both a leader and trusted partner in fish and wildlife conservation, known for our scientific excellence, stewardship of lands and natural resources, dedicated professionals, and commitment to public service. For more information on our work and the people who make it happen, visit http://www.fws.gov/. Connect with our Facebook page, follow our tweets, watch our YouTube Channel and download photos from our Flickr page.